It took the London band Franc Moody some time to perfect the ideal clap sound. They tried clapping their hands, then they tried numerous people clapping their hands. But after much experimentation, they discovered that the most pristine clap sound comes, yes, when you record three pairs of hands clapping in which one pair is wearing marigolds. This isn’t abnormal behaviour for Franc Moody. Listen to their songs and you’ll hear salt shakers and mugs, dripping radiators, the sound of someone zipping their flies, and their own family playing strings. It’s this kind of DIY sound design and attention to detail that has made the London duo such a curious and captivating proposition. Franc Moody’s sound is contemporary funk, awash with electronic inspiration, human touches, and throbbing grooves. 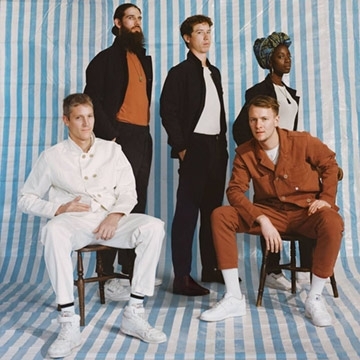 Like Daft Punk and Jamiroquai before them, they draw from the sounds, styles and techniques of funk, disco and soul while simultaneously threading in electronic influences of the here and now. And over their short lifespan as a band they’ve shown a masterful knack for creating rich and textured bangers, like “Dopamine” (which has amassed over 4.5 million streams) and “Dance Moves” (over 4.2 million streams). Their hypnotic and free-form live show has garnered a cult following.